Most of our glass manufacturing is hand or semi-automatic pressing and / or blowing of glass components to our customers own design to an agreed specification. 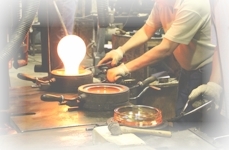 Typical of the products we make are prismatic light fittings, bulkheads, well glasses, marine & ship lighting, aircraft and airport runway lenses, exterior light fittings, laboratory glass, large jars, nosing glasses, reproduction bottles and glasses. Most production is in one of our soda lime or borosilicate clear glass types, but we also run various coloured glass types throughout the year, depending on demand. 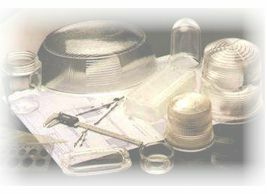 For most customers we hold customer tooling on site and produce glass components in economical minimum order quantities as required. Economic production volumes are hundreds and thousands of any one product, too large for a small glass studio, yet not large enough for automated production. Post-production processing such as sandblasting, drilling, decoration or cutting can also be carried out if required.Many customers provide their own packaging for us to pack into, or alternatively we can supply glassware in individual or bulk cartons at additional cost. For new products we can handle mould design, prototyping and manufacture. Existing tooling can be accepted in some cases when manufacture of a current product is required. Please note that drawings and/or samples are needed before we can give any idea of how, or indeed if, a product can be made and then offer budget prices.